Dr. Earlene Patterson speaks Monday during the Martin Luther King Jr. Day program at Mount Joy Missionary Baptist Church. Don’t be overly concerned with academic titles, Dr. Earlene Patterson tells her students at the SIUE Student Opportunities for Academic Results Center. What matters, she said, is character. What matters is integrity. “Titles are good. They may get your phone calls returned, or they may get you in the room, but purpose is better,” said Patterson, who received her master’s degree in education from Illinois State University and her PhD in Higher Education Administration from St. Louis University. 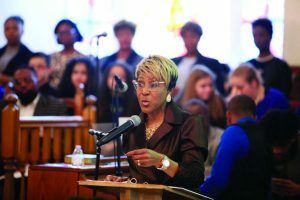 The idea that character and integrity matter more than academic titles was an important precept of Dr. Martin Luther King, Jr., whose federal holiday Patterson helped celebrate Monday in a talk at Mount Joy Missionary Baptist Church in Edwardsville. There were no empty seats at the church. Patterson spoke for nearly a half hour. King, she said, was an educated man who came to realize the importance of using his intelligence in service to the broader ideal of social justice. He was a complicated man who preached non-violence but spent his life fighting and struggling against hatred and injustice, Patterson said. To baby boomers in the crowd, Patterson stressed the urgency of “passing the baton” to the next generation. Every generation is charged with advancing justice and equality for the next. Think of it as 4-by-100 meter relay, she told them. To succeed requires both speed and precision. Passing the baton precisely is paramount. And there are universal human needs that transcend race or social status, she added.